Robert Crumb is one of the most highly regarded American comics creators, but the past few years has seen both a backlash against his perceived sexism and downright revulsion towards his comics by younger people, as well as a free-floating discussion over teh comix blogs about how Crumb isn’t seen as a major influence over the current generation of comics artists. I’ve always been a Crumb fan, but not a fanatical one: I’ve bought all his solo comics as they’ve been published over the years (from the late 80s on; I’m old but not that old), but haven’t really gone all in. 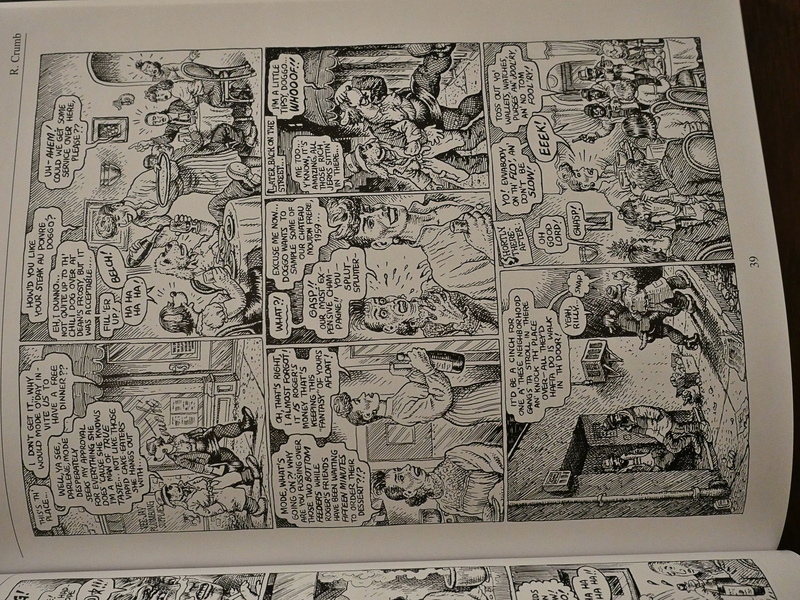 So some months ago these things made me wonder whether Crumb still has a significant presence publishing wise. Somebody as famous, controversial and talented as him would surely have his work collected in a series of beautifully designed and curated collections? 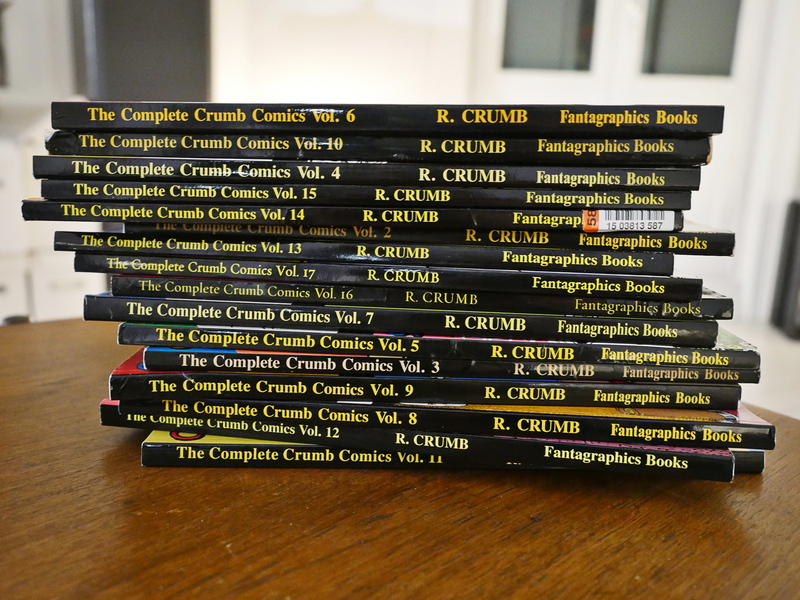 It turns out, while I’ve not been paying attention, Fantagraphics Books released 17 volumes of The Complete Crumb Comics, released between 1987 and 2005. Whaa? How did that happen? I was vaguely aware of these things, but I’ve either never seen anybody talk about them, or I’ve repressed the memory. Probably the latter. I had bought the two first volumes in the 80s. They’re consist of Crumb juvenalia. Possibly of interest to somebody, but not a teenage me. I was apparently so turned off by those two volumes that I blanked on the rest of the series. The design of these books is really unappealing, too. They’re on white, shiny paper, in approximate European album size, with French flaps. 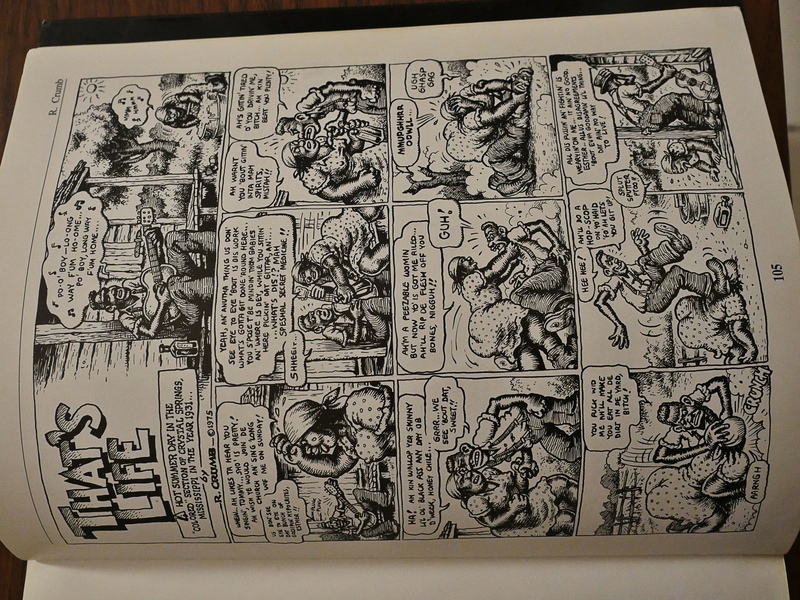 You have these 1pt borders around Crumb’s really organic artwork, and, of course, since this is a “serious” endeavour, you have the top of each and every page reminding you that you’re reading The Complete Crumb Comics, and, yes, it’s by R. Crumb. Because that’s what “real” books do, presumably. The juxtaposition between the mechanical layout and the artwork is jarring and unpleasant. Except nobody cared enough to look for glitches. I know, you’re starting to read this in Comic Book Guy voice now. 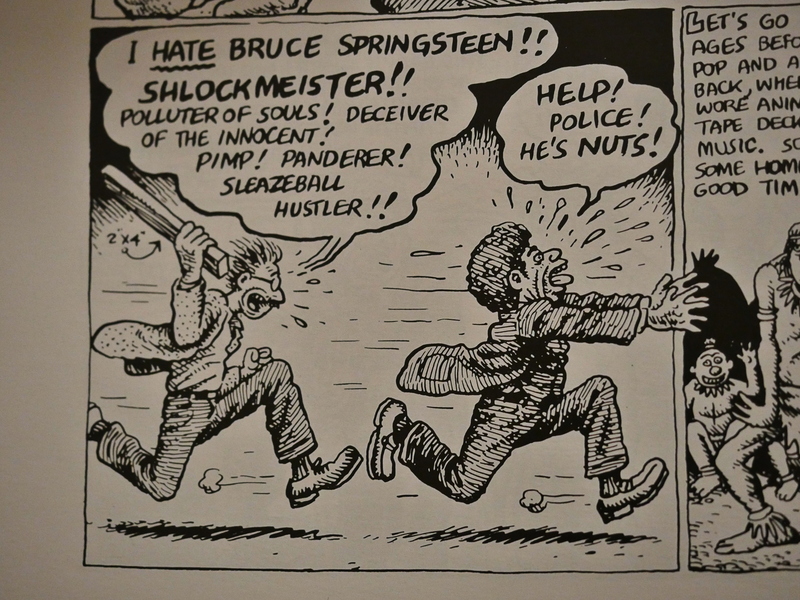 But I found reading this stack of comics to be rather a chore, and I don’t think Crumb’s the main person to blame. The format just doesn’t suit the material. Most of it was created with a smaller format in mind, which leaves the “enlarged” (i.e., published at larger size than intended) artwork looking somewhat amateurish in places. Not to mention the problems with reproduction quality. 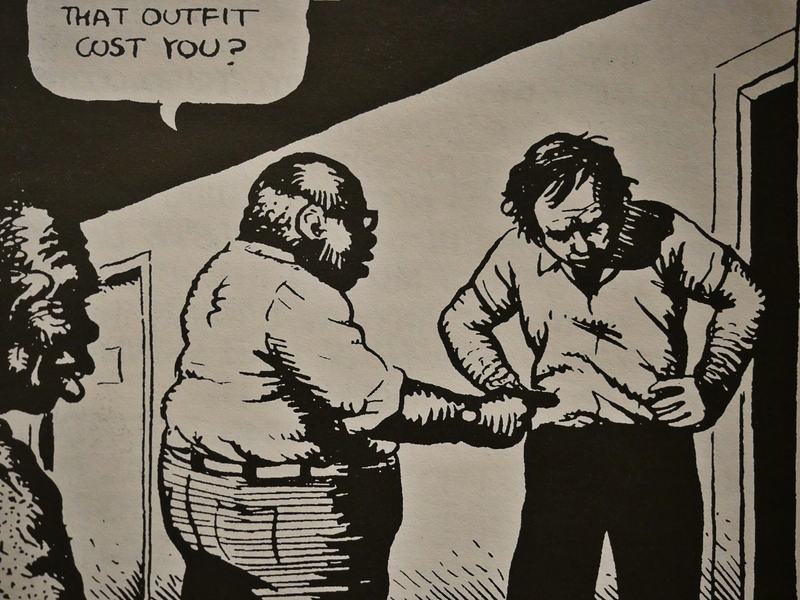 Here’s a snap from a panel from an issue of American Splendor I have here. All the blacks (er, I mean) have filled in greatly. Some of the finer black lines are preserved better than in the original printing, but the white lines have greatly been reduced and disappears here and there, leaving a blotchy and less pretty image. All the detail in the middle lower half is missing. You also have the opposite problem, where black lines go missing on a lot of pages. Aline Kominsky’s lettering has all but disintegrated, and her beautiful drawing looks blotchy and unpleasant here. Now, I can only guess how Fantagraphics sourced the material for these books: Getting negatives from the other publishers? Reproing from original artwork? Shooting printed copies? Or, as here, shooting from faxes of copies of printed comics? 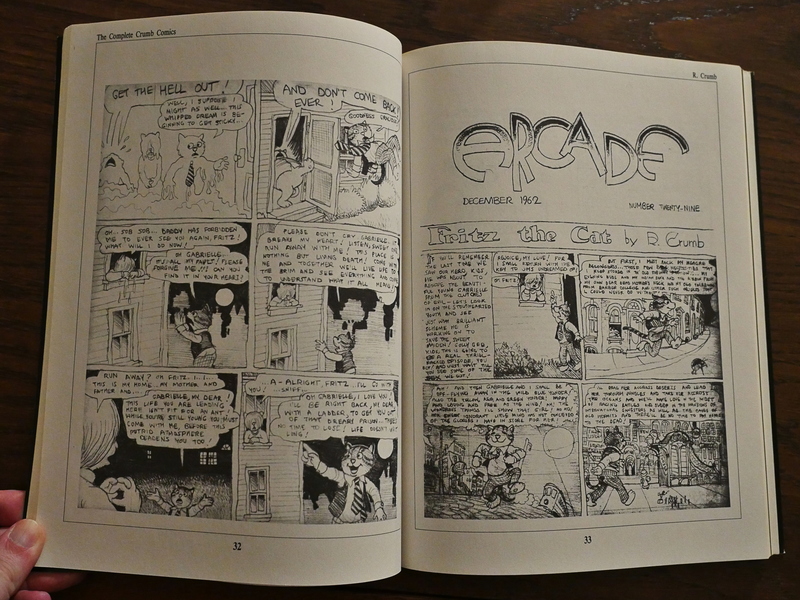 The final three volumes, covering the Weirdo years, are quite different from the preceding ones: Instead of being strictly chronological, they devote the first half of each volume to printing Crumb’s contributions to Weirdo, and the latter half to misc. drawings. I’m not sure I approve; I’m not sure I enjoyed the hodge-podge feeling of the first volumes, but when it changed the organisation, I wasn’t sure that was an improvement, either. Anyway. 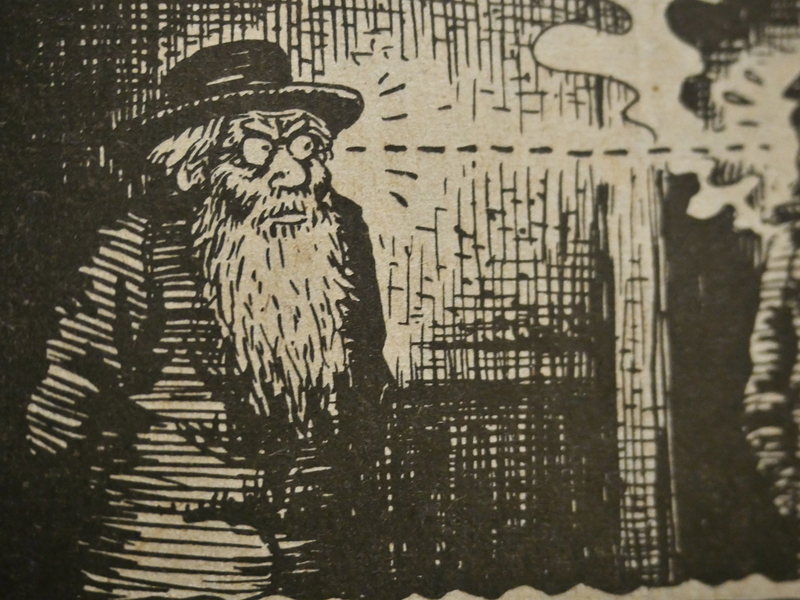 Crumb is still a huge name: When he adapted Genesis (from the bible, not the record shop) there was an enormous amount of attention given. 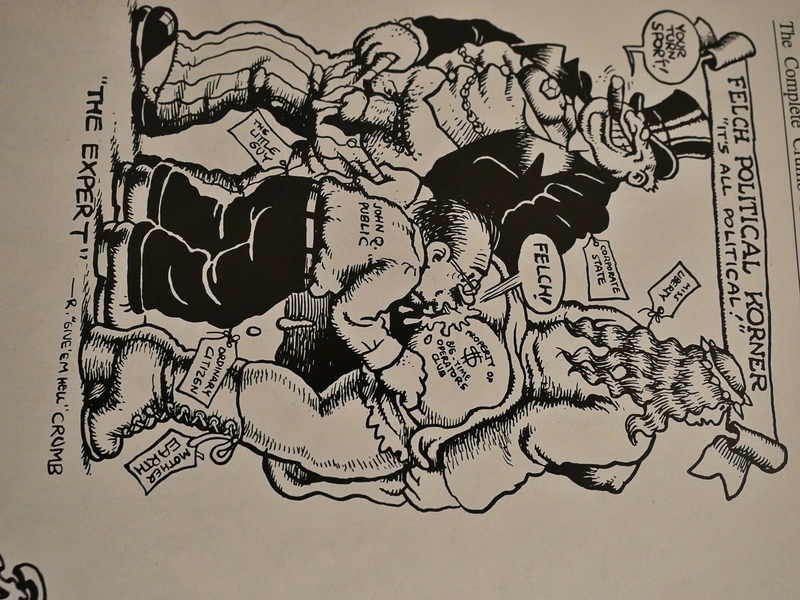 If I had a dime for every time I’ve read somebody saying “Well, everybody prefers the 60s stuff, but I really think the mid-80s stuff is Crumb’s best” I would probably have less than a dollar, but not much less. And I think it’s true that the 80s stuff is the strongest. The final three volumes are beautifully reproduced, and the first half of each volume is chock full of great comics. Often a bit on the wordy side, and usually very dense, but funny, interesting and beautifully and expressively drawn. The last half of each volume is filled with ephemera that only a dedicated fan would be interested in. 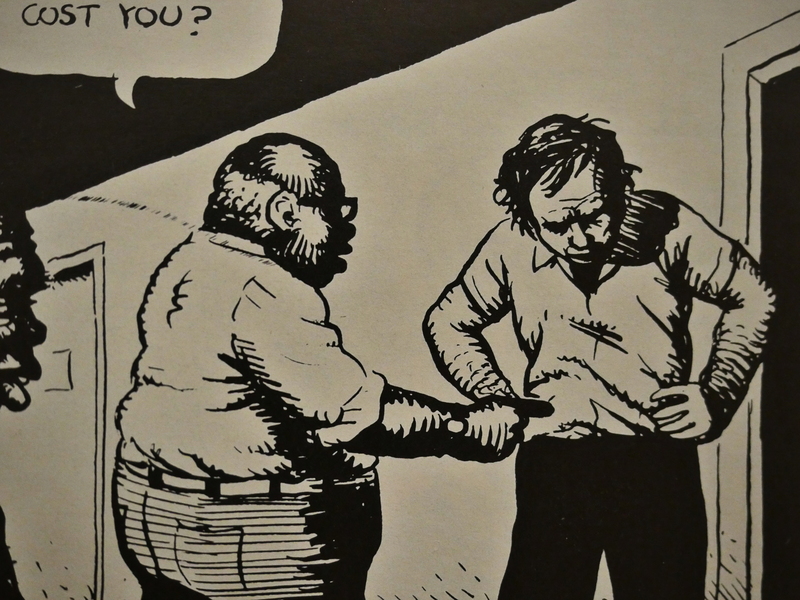 So to get back to the question that started me down this Crumb journey: Why aren’t young cartoonists these days interested in Crumb? I think part of the issue may be that The Complete Crumb just isn’t very good. I’d say two thirds of the pages in this series aren’t very interesting. And, as I’ve been harping on for ages now, these books have an ugly and offputting design. 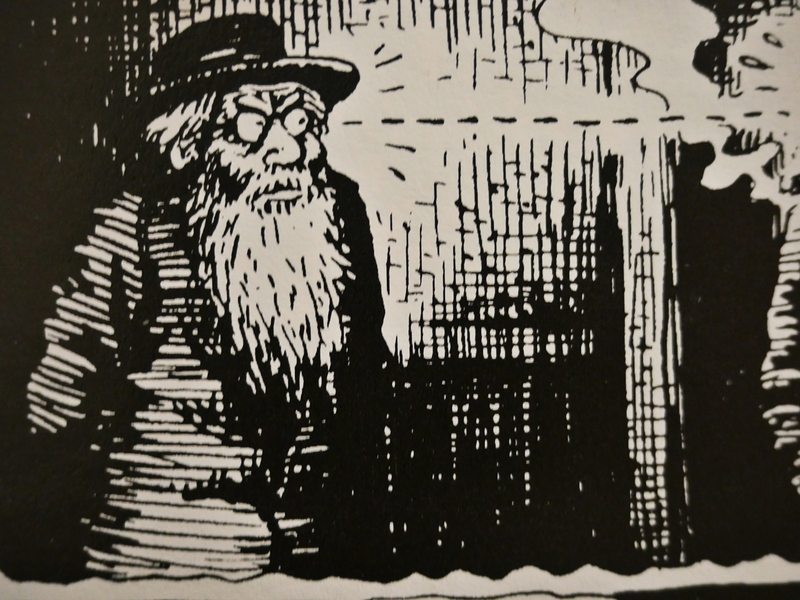 That stack of books is a turn-off, and that’s not something I thought I’d write about Crumb. And besides, why should kids these days care? There’s more interesting things being published today that anybody could ever hope to keep up with, so I don’t think there’s any need or compulsion to look back to underground comix for inspiration. 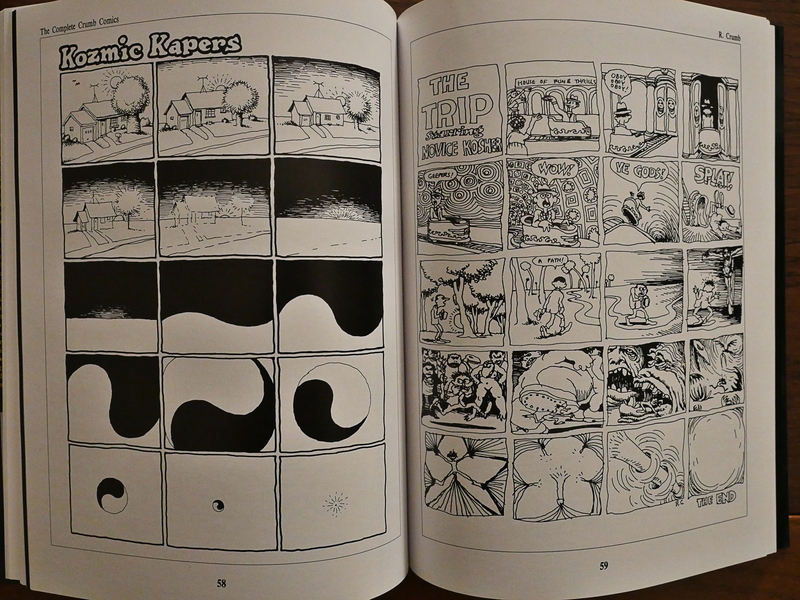 Now, Fantagraphics stopped publication in 2005, and have lethargically kept some of the volumes in print after that. 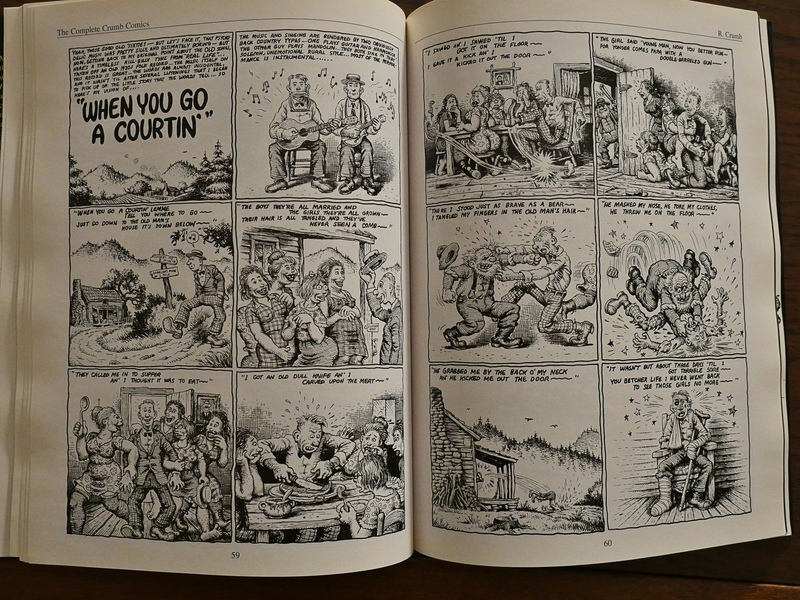 The past couple of years Crumb’s older work has gotten reprinted in more handsome volumes, like this one. 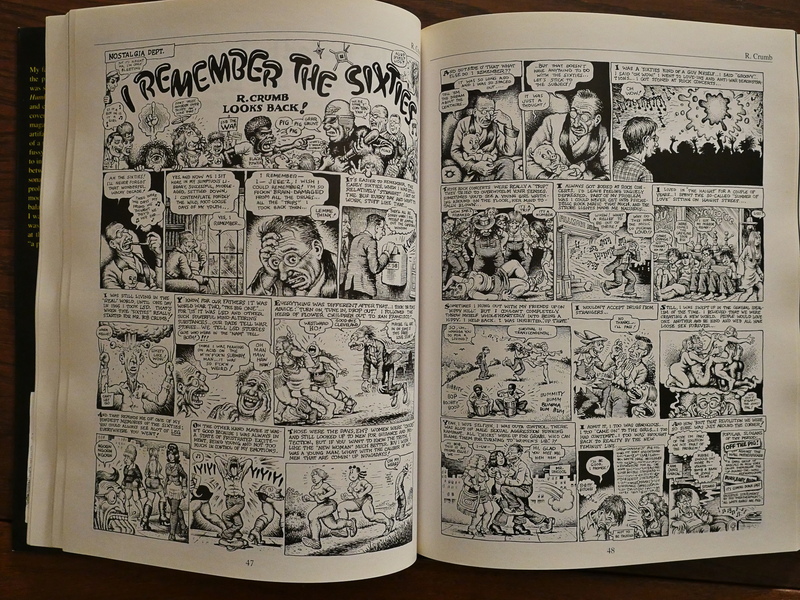 Perhaps somebody can manage to curate an interesting collection of his comics in a beautiful package, and Crumb will be in vogue again?